It's about time I introduced one of my favorite radio programs of all time: Here on Earth: Radio Without Borders. 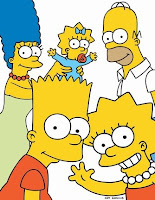 It's hosted by Jean Feraca and in this show, her guests discuss the impact of the Simpsons around the world. She always has intelligent people (professors, authors, and other non-yellow characters) on the show whose IQ must be double or even triple that of Homer S.! The topics are often quite interesting, like this one about Bart and Marge and the rest of the gang, especially the cultural programs. You can find Jean's blog here, where she discusses the latest shows. The forum gives people a chance to add their two cents. * Are the Simpons really the typical American family? * How do you feel about Homer and Bart as American ambassadors? * John 7/19/06: "I think the Simpsons Cartoon demonstrates to the world that Americans have an insight into what's dysfunctional in our own culture by allowing the world to laugh with us at our beer guts and lazy intellect." I think that says it all. Americans are not as stupid as they seem to the unsophisticated European.